Cowboys have a big issue at hand due to their facilities falling down! It is a very sad day for the Dallas Cowboys. 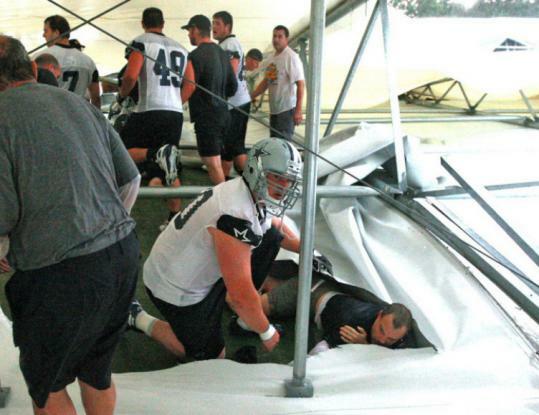 Last Night the Dallas Cowboys had an issue with the structure of their practice facility. Yep It just collapsed. Regardless of the reason, the Cowboys now have to deal with the legal issues that will stem from the 12 people who have been hospitalized. At least two of these people are in serious condition. Joe DeCamillis, who is the cowboys special teams coach, suffered a neck injury, so this incident could effect the cowboys for an extended periods this season. Without a doubt this will negatively effect the Cowboys mini camps this off season. Legally the cowboys are in trouble considering, there have also been reports of a person being Impaled by an object and another having a severed spine. Next time Jerry Jones, don’t put in the “linchpin” yourself ! To me this just seems like a omen showing the days that are to come for this team adjusting to life without T.O. Thank God Jessica Simpson made it. My 2009 prediction Romo will choke without T.O. this season. Cuz Roy Boy ain't that good kids!! !